That is true in the most technical sense, though the couple’s understanding of communication is nearly always limited and secularized. While they may not be talking well to each other, the problem is much deeper than they realize. Communication problems begin in the heart of the person while reaching into the community of the Trinity. 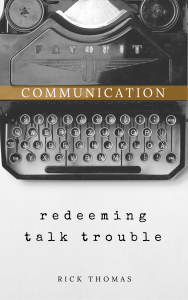 This book will help you redeem your talk trouble. The most effective way you can use this book is to read slowly, reflectively, and prayerfully while adding journaling and daily practice to your list of habits. I would not recommend reading just to be reading. I appeal to you not to let the words in this book rest. Use them often. Share them with your friends. I promise if you can practically grasp this content, which will be measured by how well you talk to those who are closest to you, your life and relationships will change. That is my prayer for you and your friends.